Since you did such a good job of creating a mounded shape in years 1 and 2, the plant is so full by year 3 that using your pruners is not the most efficient way to prune any longer. A small sythe or curved harvesting knife is a much better tool for this. Grab the flower stalks by the handful and slice them off at the base. Don’t try to do the whole plant at once. Just grab what you can hold. In frost free areas, your lavender plants may remain evergreen. You can prune at harvesting time and prune to shape in early spring. Winter is not kind to lavender plants. 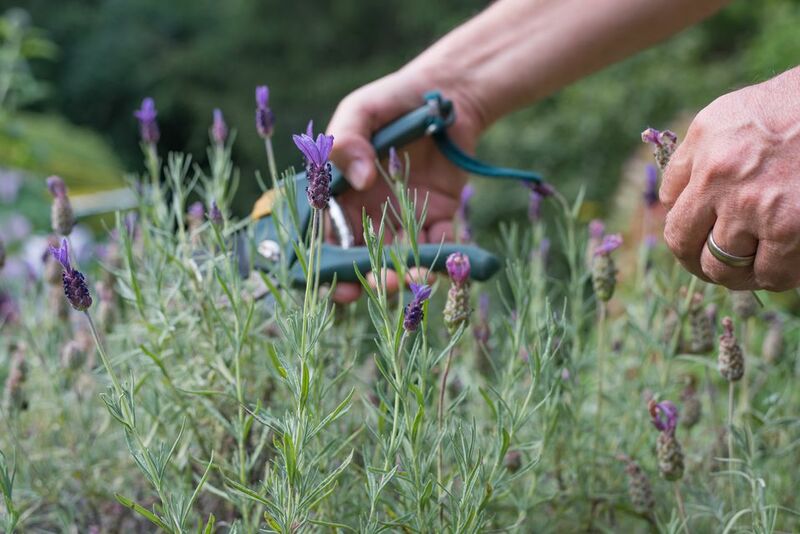 In areas with freezing winter temperatures, you should hold off doing any hard pruning to your lavender plants until you see new growth starting, in the spring. The top growth will serve as insulation, keeping the crown and roots of the plant protected from repeated freezing and thawing. Don’t wait too long to prune, though. You should see the new growth by the time the tulips are blooming. If you wait longer, you risk cutting off the flower buds that are forming. There will probably be some winter die back, but if you wait until the new growth starts, you will be able to see which stems are dead and can be pruned out. If you get a second flush of blooms in the fall, you can go ahead and cut them back. This will remove some of the top growth, but you don’t want all those flower stalks weighing the plants down. The one thing to look out for here is wet soil. If you have a mild, but wet winter, check your lavender plants to make sure the tops are not holding excess water, which can cause the crowns to rot. You never want your lavender to be sitting in wet soil, which will rot the roots. Make sure it is growing in a well-draining site to begin with. Lavender is not the easiest plant to grow in most areas, but your best bet at success is to get your plants well established early.